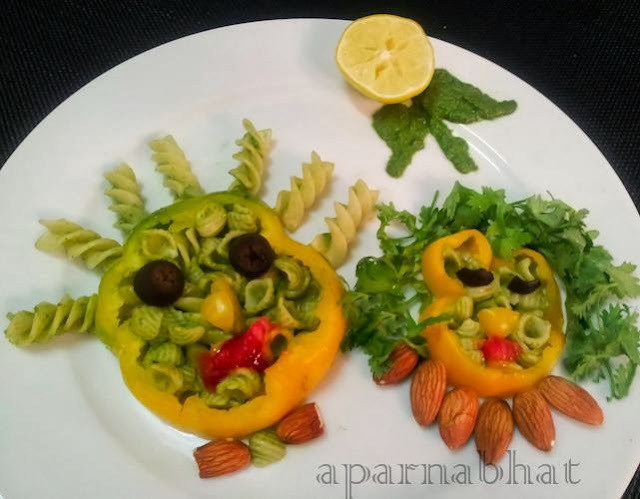 Pasta is a kid friendly and easy to cook dish. Boil the pastas as per packet instructions. Strain, rinse in cold water and drizzle olive oil over it. Keep it aside. Blend the ingredients as mentioned above to green smooth paste. On low flame take little olive oil in a pan, add chopped capsicum [2 tbsp], green smooth paste. Sauté for some time, add sliced black olives and then mix the boiled pasta. Mix it so that the green smooth paste coats the pasta. Switch off the gas flame and serve it hot.